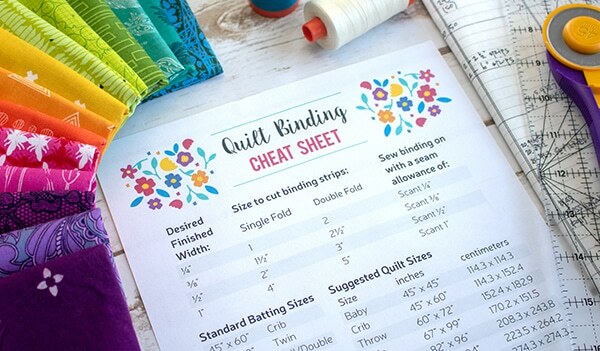 One of the most frequently asked questions we’re asked is, “What pens should I use in my Quilter’s Planner?” We decided to buy some of the top brands of pens and put them to the test! It should be noted that there are pros and cons to every writing choice, and the “best” writing tool for you depends largely on your personality. Our paper has been carefully selected to balance weight with the ability to use multiple types of pens, so most pens on the market will write well in our planner. With that in mind, here’s what we found! 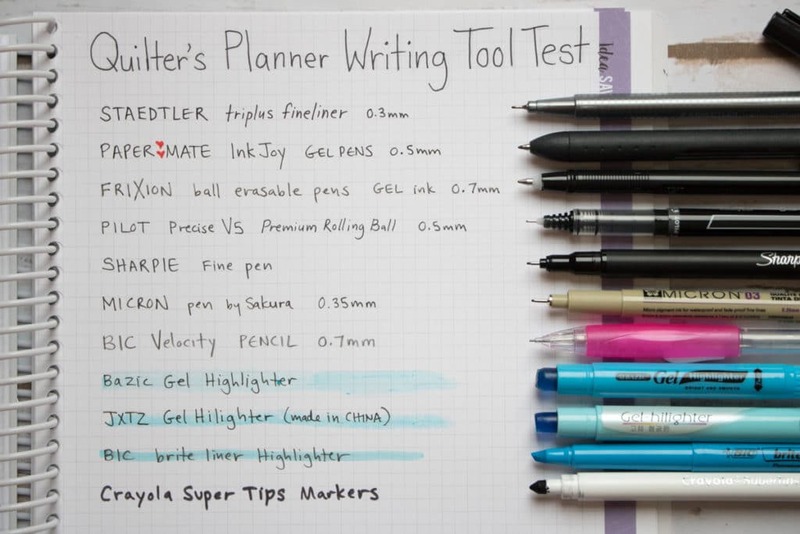 We tested a wide variety of writing tools–pens, pencils, highlighters, and markers. 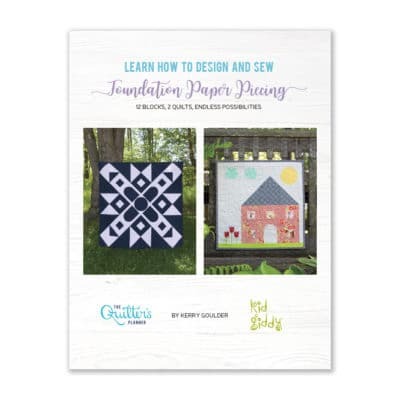 We wanted to see how each writing tool performed on the Quilter’s Planner pages, and looked at the thickness of the lines, tested whether they smudged easily, and looked for ghosting or bleed through. Bleeding: this is a bummer when it happens. A bleed is when ink has penetrated the paper and makes it impossible to write on the opposite side of a paper. The good news is, not a single writing tool bled through the paper, and only one came close: the Crayola Fine Line markers I borrowed from my kids. While the 50 color options are fun, most people wouldn’t opt to write in their planners with washable markers anyway. I first wrote out the name of each writing tool with any defining information so that I could compare the way each writing tool writes on the Quilter’s Planner paper. They all wrote smoothly, with no feathering. Next, I added another test: a smudge test. Next to each pen name, I wrote the word “smudge” then immediately rubbed my finger across it. The Frixion gel pens, Pilot Precise V5 pens, and Crayola Super Tips Markers smudged the most, with very little to no smudging from the others. This information might come in especially handy for our left handed planning friends. 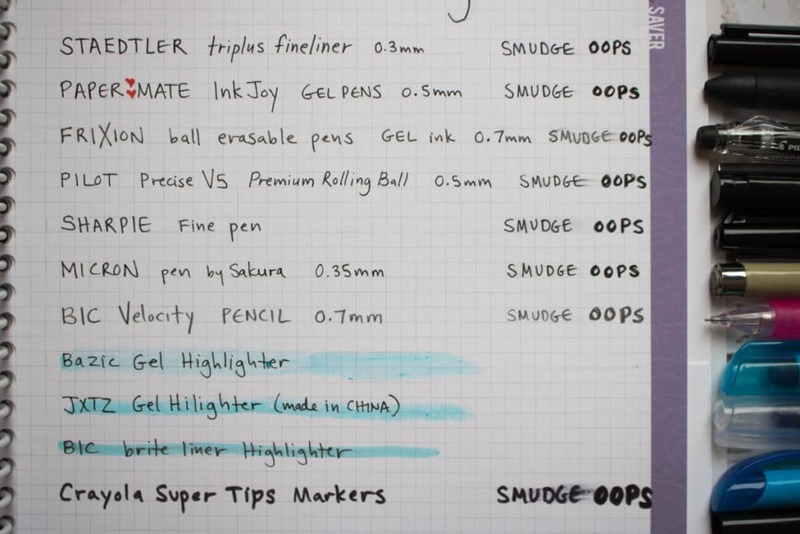 Next to the word “smudge”, I also added an “oops”, since we are all bound to make mistakes and need to cross out or write over something we’ve written, so I thought it would be helpful to test whether thick writing would ghost on the opposite side of the paper. I aimed to go over each “oops” at least 3-4 times, imitating the way I try to cover my mistakes when writing and laying it on nice and thick with each writing tool. Now let’s see what the opposite side of the paper looks like! As you can see, there is only very slight ghosting from some of the writing tools, specifically the red Pilot pen, and the Crayola Super Tip Markers, but no bleed through. The Bic Velocity Pencil has no ghosting at all. Since we quilters love to live colorful lives, I also took a look at what colors are available from each brand of pens. Many brands of pens have many color options, so note that this reflects only the sets that I had, and not necessarily the full offerings of each brand. Here are the stats for each pen. Note that prices reflect an approximate price according to Amazon.com listings on the day that this post was written. 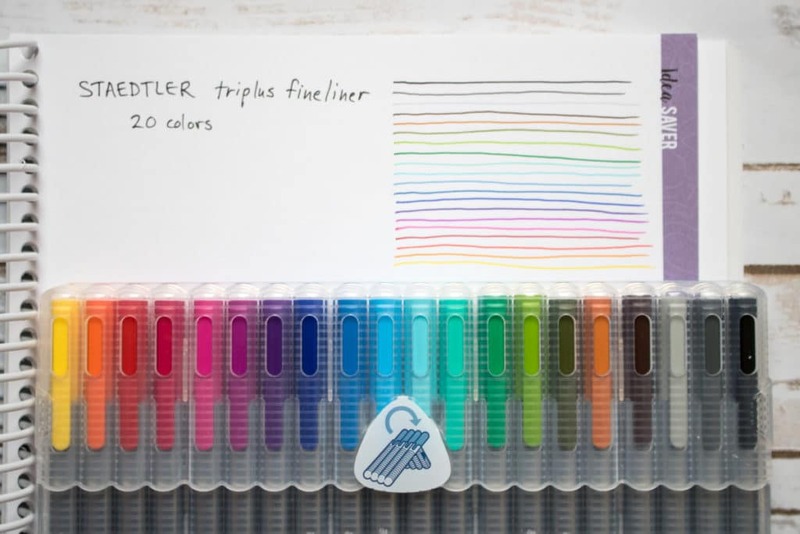 The Staedtler triplus fineliner pen set that I have has 20 colors, but Staedtler triplus fineliners are also available in packs with 10, 36, 42, and 50 colors. There is definitely a great variety of color options for these pens! They also come in a case that opens into a prop to stand up the pen pack while you’re using them. The pens have a slim ergonomic triangular shape. 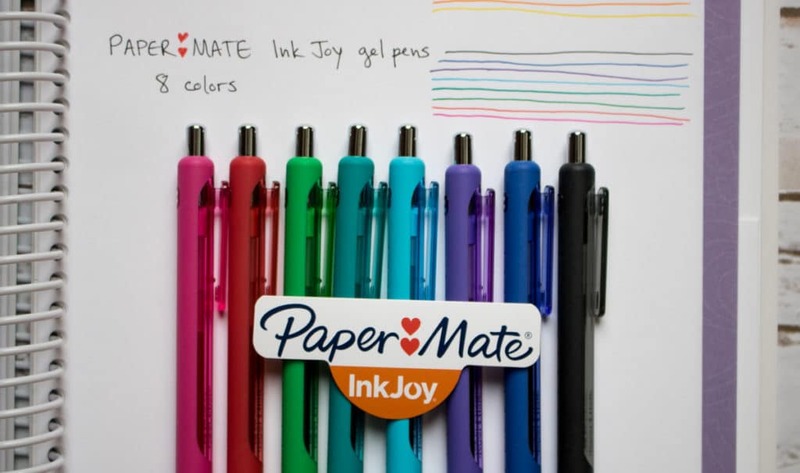 The Papermate Inkjoy gel pen set that I have has 8 colors, but they are also available in packs with 6, 12, or 14 colors. The pens are retractable and come in disposable packaging. 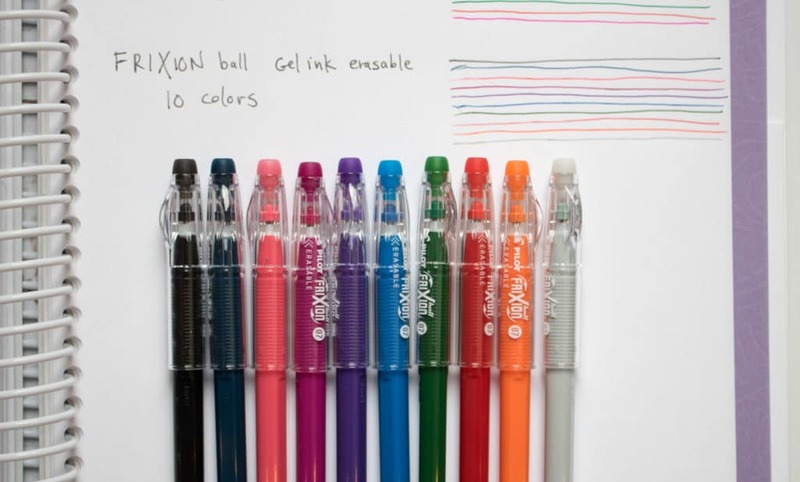 The Frixion Ball Gel ink erasable pen set that I have has 10 colors, which appears to be the largest color assortment. They are also available in packs of 12 of individual colors if you find you use one color dominantly. The pens come in disposable packaging. The pens are erasable, but also are rumored to disappear in hot temperatures. 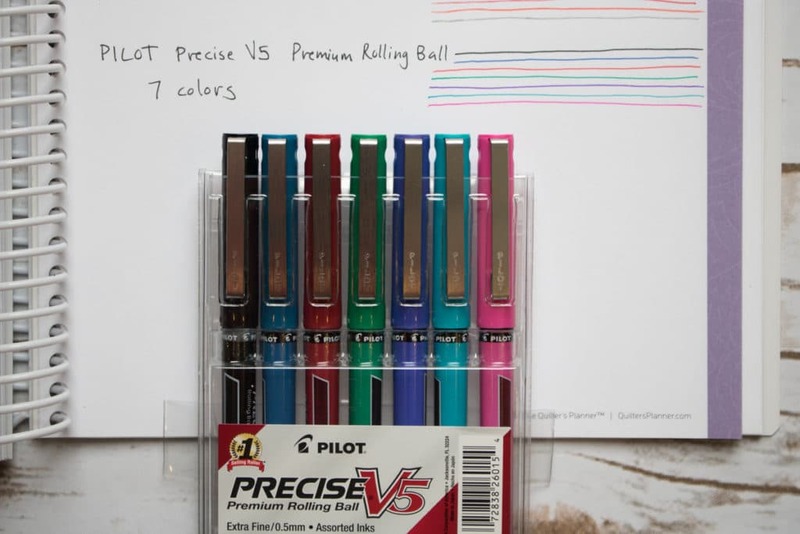 The Pilot Precise V5 Premium Rolling Ball pen set that I have has 7 colors, which appears to the the largest color assortment. The pens come in a plastic pouch that can be used for storage. 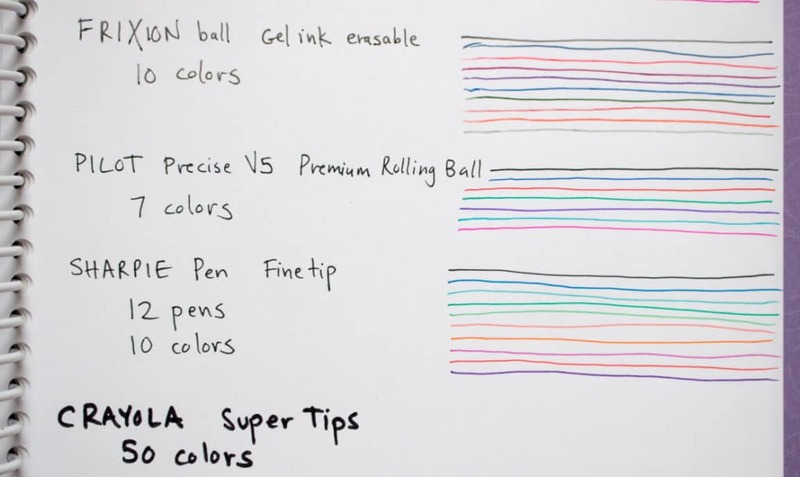 With the roller ball style, these pen tips look inkier than the others, but the writing appears smooth and did not blotch. The Sharpie Pen set that I have has 12 pens and 10 colors, but Sharpie Art pens are also available in packs with 8, 16, or 24 colors. These pens came in disposable packaging, but sets are now available in hard storage/display cases. It should be noted that these are Sharpie pens and not markers. 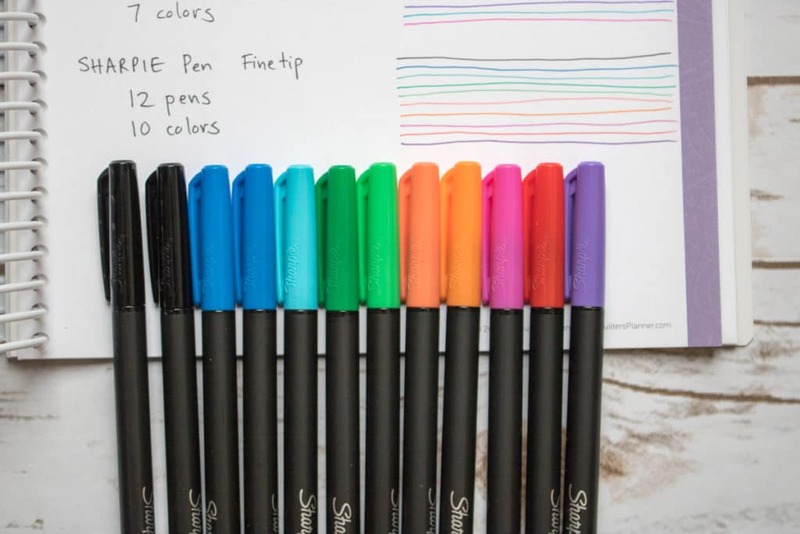 Sharpie markers will bleed through most paper, so please note what type of Sharpie you use! Micron pens are available in many art supply stores individually for approximately $2-3 apiece, or in sets on Amazon. 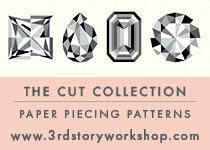 They come in a wide variety of nib sizes, from 0.001mm to 2mm and larger. The pens come individually or in disposable packaging. 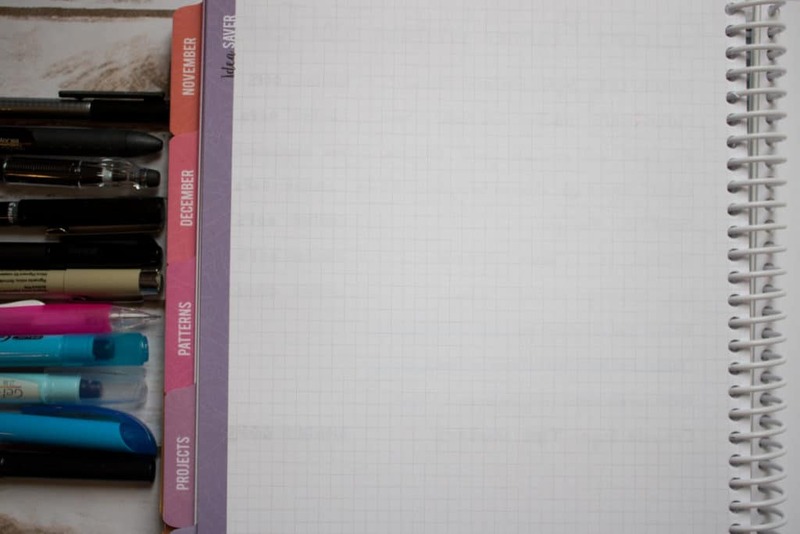 The wide range of available widths are popular with those who practice lettering in their planners. Bic Velocity Mechanical Pencils stand apart from pens for the obvious reason–it’s a pencil! This means that it is erasable, doesn’t ghost at all, and is easy on the pocketbook. It also means it only comes in one tried and true color. As long as you have a replacement cartridge of pencil lead, you can always have a forgivable writing tool handy with a mechanical pencil. The set I have came with 4 different colored mechanical pencil barrels, a cartridge of replacement lead, and replacement erasers. 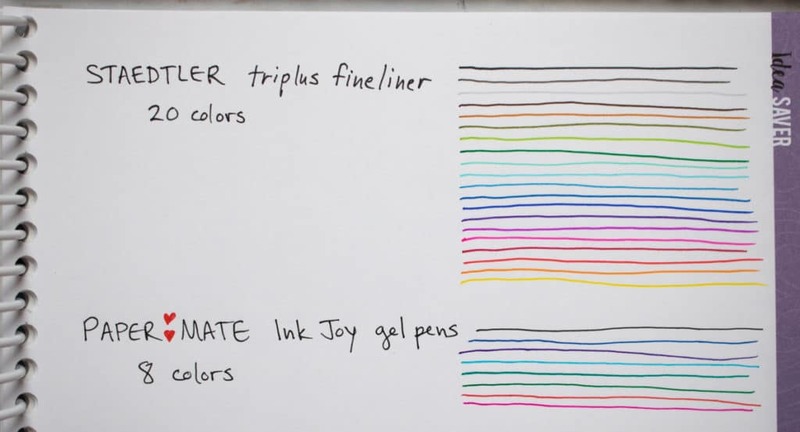 To be honest, I first borrowed these markers from my children before I had any colorful planner pen sets because of all of the color options! I use them to color code different parts of my planner, and use them to color in the circles on the Habit Tracker. They come in a cardboard box similar to other Crayola markers. 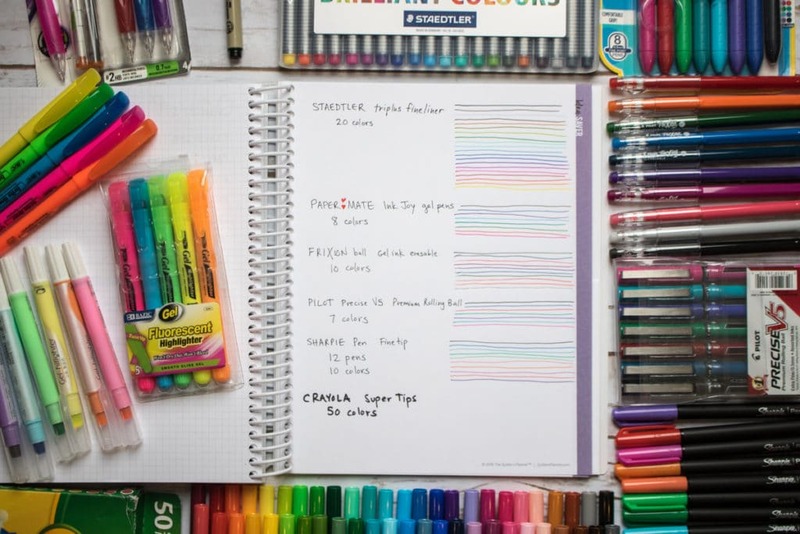 While I would not use these markers to write in my day-to-day to-do lists, they add a fun pop of color here and there, as long as you write lightly or don’t mind ghosting. All Highlighter brands seem to be comparable in terms of colors available and quality of writing. Generally highligher packs include pink, blue, green, orange, and yellow. We tend to prefer gel highlighters because they eliminate any chance of bleed through (gel highlighters are frequently used to highlight the text in religious texts that have very thin, delicate pages. They come in a lot of fun, glowing colors. The downside? Gel highlighters do feel sticky to the touch after use. 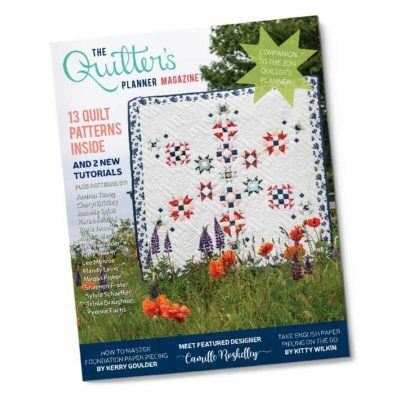 Overall, the carefully selected quality of the paper in the Quilter’s Planner means that most pens and writing tools will perform well. Choosing a favorite is very much a personal preference and depends both on your planning methods (colorful or black and white), your tolerance for ghosting, and how high having an erasable writing tool ranks in your preferences. 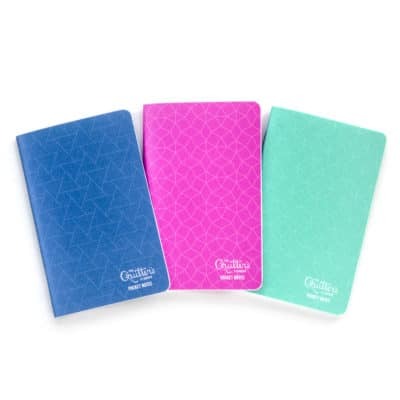 What we do know is that there is an ever-growing availability of colorful writing tools for your planner! Best of luck finding the perfect ones for you, and happy planning! 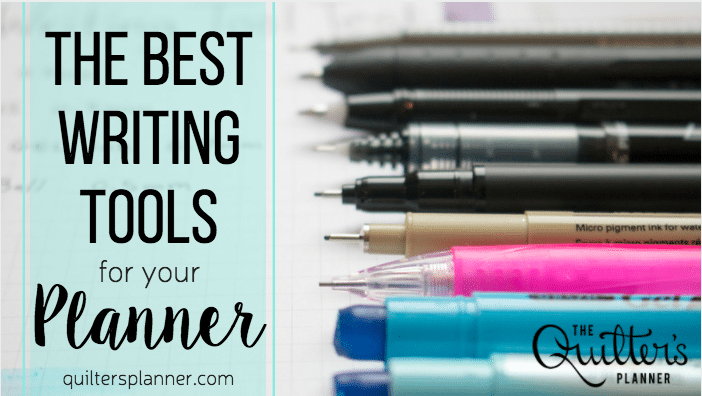 If there’s a writing tool that you love and we haven’t included in this post, please leave us a comment in our Facebook group or on Instagram (@thequiltersplanner) and let us know! We are continuously seeking the best writing tools on the market to help you select the ones that work best for your lifestyle.